Quickie 2.4 loop. Start on Main St., down Commercial/Kendrick to the harbor, and then back up Chequessett Neck Rd., back up to Main St.
Longer loop: 3.0 miles. At intersection with Chequessett Neck Rd., take a left on Hamblen Farm Rd., and then a right on Old Chequessett Neck Rd., back to the center of Wellfleet. 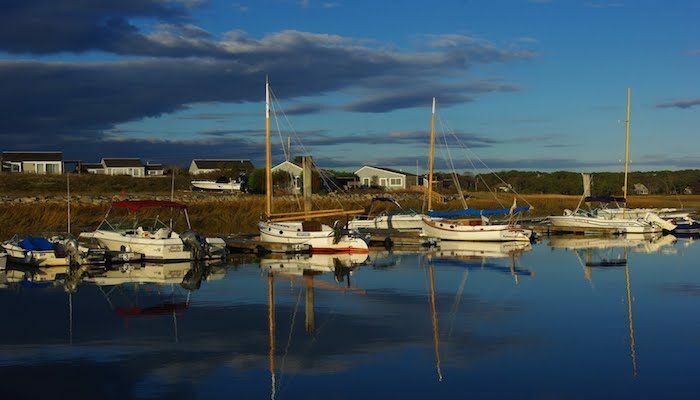 For a wonderful longer run, from Wellfleet Harbor, take a LEFT on Chequessett Neck Rd., staying along the water, and over the bridge, to the Great Island parking lot. It’s 3 miles one-way.